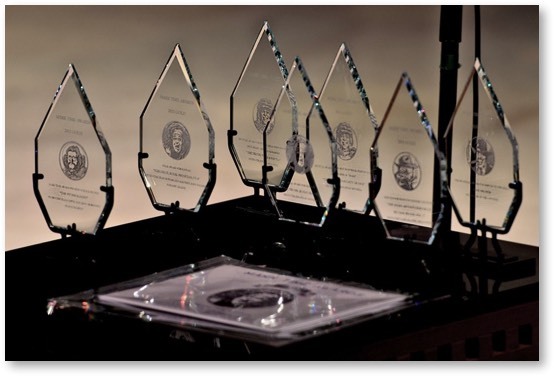 KANSAS CITY, MO–June 12, 2015–The Mark Times Awards given annually to the best audio theatre in the Science Fiction, Horror, Fantasy, and Mystery genres were announced tonight at The Heartland Theater in Kansas City. The ceremony was held as part of the National Audio Theatre Festivals’ HEAR/Now gathering, now in its third year in the Kansas City. The presenting organization of the awards, Otherworld Media, with funding from the Leo Gilbert Wetherill Foundation has moved the ceremony from Minneapolis, where it had been held for seventeen years at CON-vergence, the long-established science fiction convention, to Kansas City as part of the HEAR/Now Festival for the Audio Arts and where it is launching a national education initiative in the audio arts. Ceremony host, David Ossman, founding member of the Firesign Theatre and whose original character “Mark Time” gave the awards their name, reminded the audience that the awards are intended to honor the art form of which the Firesign Theatre is a key proponent. All sorts of genres, satires, pop culture, and works of the surreal imagination lend themselves to the art and craft of the audio medium, he said, and were the basis of the Firesign’s unique production style and humor. The Mark Time Awards, Ossman stated, are a way to honor that legacy. Demonstrating their commitment to training and educational youth outreach on behalf of the medium, the presentation of the Mark Time Awards was preceded by performances with members of the Mark Time/SoundPlay production workshops conducted at Paseo Academy of Fine and Performing Arts in Kansas City, by Otherworld Media producer Judith Walcutt in cooperation with Paseo faculty David Luby and Chris Odam, with additional technical and material support from the Wetherill Foundation. Three short plays, a noir mystery “Stunning Blonde” by Etham Anissey, a horror piece, “The Affliction” by Carissa Stevens, and the Sci-Fi inspired “Death Battle Three” by Isabela Coleman and Zhyesia Jameson, were done live, with live Foley and sound design. Three solo voice pieces with sound elements, “Enigma” by Mushelle White, “Whispers” by Jordan Stewart, and “Gates of Heaven” by Byron Hyde, along with Eishenae Goldsby’s “We’re Doomed,” in which all voices and effects had been accomplished with smart phone apps, filled out the half-hour program. The students from Paseo included Ethan Anissey, Isabella Coleman, Eishenae Goldsby, Byron Hyde, Zayesia Jameson, Ellia Johnson, Marcus Robertson, Keylisha Nelson, Khalil Odums, Miguel Ornelas, Elena Parker, Carissa Stevens, Jordan Stewart, Trayvon Wainwright, Mushelle White, and Ignacio Zollar. The student production unit was awarded the first Runyon Award for Youth Audio Production for their work. The trophy was accepted by the students and their Paseo mentor, David Luby. Following the live performance, host David Ossman announced the winners of the Mark Time Awards, in all categories. The Gold Mark Time went to “The Futurologist,” produced by Eliza Smith and Leon Morimoto, Snap Judgment Productions, Oakland, California. The Silver Mark Time was awarded to producer Dieter Zimmermann, Protophonic Productions, Cape Town, South Africa. Finalist certificates went to “Voyager Found,” produced by Jonathan Mitchell of New York and “To The Manor Borne by Robots,” produced by John Eder of Los Angeles. The Gold Ogle for Horror was taken by Jonathan Mitchell for “Sylvia’s Blood,” and the Silver by “Clones In The Closet,” produced by Jon Holland for The Theater In Your Mind. Holland was in Kansas City to accept the award. In the Fantasy category, the Gold Ogle was awarded to “Alba Salix, Royal Physician,” produced for Forgery League in Toronto, Canada by Eli McIlveen, who was also present at the ceremony. Two additional Ogle Finalists included “A Prophets Guide,” produced by Matthew Boudreau, Aural Stage Studios, Buffalo, New York, and “A Journey With Strange Bedfellows,” produced by Forest Rose and Final Rune Productions of Monument, Colorado. The executive producer, Jan C. Jones was present to accept the award. The first Nick Danger Prizes, so named for the well-known Firesign character made famous by Phil Austin, were awarded in a very close contest. The Gold went to “The Audio Adventures of Big Dan Frater, Volume 1,” produced by Larry Blamire, Brian Howe and Alison Martin. Brian Howe acceptd the Prize by telephone. The Silver Nick Danger for “Blues For Johnny Raven,” produced for the Atlanta Radio Theatre Company by David Benedict, who also was in the theatre for the Awards. Judith Walcutt, Executive Producer of the Mark Time Awards and Executive Director of Otherworld Media, had a final prize to give – the Mark Timekeeper – to Sue Zizza, the executive producer of HEAR/Now, the Audio Fiction & Arts Festival which included the Mark Time Awards in its weekend schedule. The Timekeeper – a wall-sized wall-clock with Mark Time’s image as drawn by renowned illustrator William Stout – honored Sue’s long-time administration of the National Audio Theatre Festivals. See all the Mark Time Awards winners on this site.